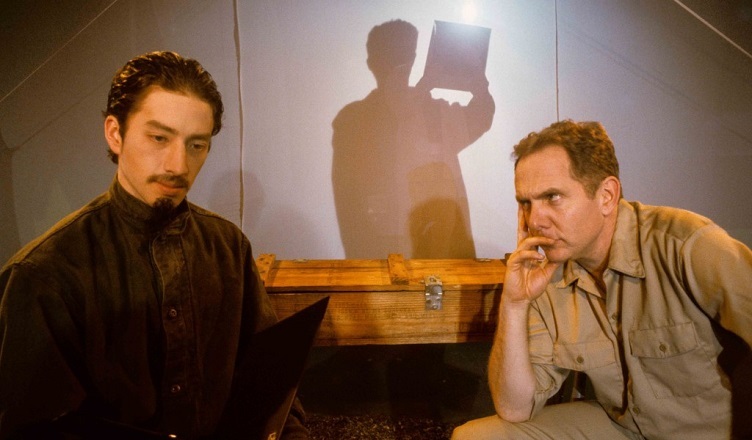 Pictured, L to R: Todd Haberkorn as Ho Chi Minh, and Bruce DuBose as OSS Officer in Mac Wellman’s Two September, Undermain Theatre, Dallas, 2004. Julia Jarcho, Writing and the Modern Stage: Theater Beyond Drama. Cambridge: Cambridge University Press, 2017. 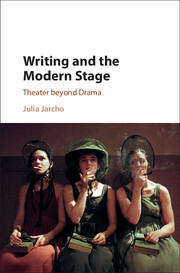 Julia Jarcho’s first monograph, Writing and the Modern Stage, is a perverse study of the role of writing in modernist and contemporary American theater and performance. “Perverse” is not pejorative here, but rather echoes Jarcho’s own description of the book’s project: “It’s my contention that the study of theater today would do well to turn toward the literary—not least because the suggestion sounds so perverse” (x).1 As Jarcho notes, there is something undeniably appealing in a contrarian argument that pushes back against decades of scholarship that have privileged ontological questions of performance, often at the expense of “the text” and serious considerations for the literariness of dramatic literature. Yet herein also lies the potential double-danger of such a project: Jarcho’s argument threatens to flirt with a “critical regression” away from recent scholarly trends, and it also presses her to spar with some of the most canonical heavy hitters of contemporary drama, theater, and performance studies, amongst them Hans-Thies Lehmann, Martin Puchner, and W.B. Worthen (x–xiii). Fortunately, Jarcho is more than up to the challenge, and her book runs on more than just the shock value inherent in its central turn towards the text. Throughout her chapters—which cover an audacious array of writings in multiple genres authored by Henry James, Gertrude Stein, Samuel Beckett, Suzan-Lori Parks, and Mac Wellman—she deftly weaves thoughtful, attentive readings of both literary and theoretical texts in pursuit of the productive tension between writing and performance that encapsulate what she describes as “negative theatrics” (xiii). In pursuit of this theory, Jarcho begins by addressing the growing terminological divide between “drama” and “theater” in scholarly discourse, particularly challenging the tenets of Lehmann’s “postdramatic theater.”2 Against this celebration of “the eventful present” of “theater,” Jarcho suggests (via Peter Szondi and Bertolt Brecht) that “drama” too insists on the present/presence of performance, “absolutiz[ing] the here-and-now” by absorbing audiences “into the present so fully that no elsewhere, no other time remains” (xi, 11). By folding the temporality of performance into her own definition of “drama,” Jarcho reformulates “theater” into a disruptive force that allows audiences to register the “burden of actuality” built into the present (7). The present/presence of performance is no longer a desirable condition, but instead an affirmation of how “awful” the present can feel because of its continued subscription to the status quo; this in turn prompts audiences to “break out” of the dramatic present towards that “which would be radically different,” both aesthetically and politically (7). Such a utopia is not a discernible, representable telos, but rather an alterity that can only be courted for its radical departure from the here-and-now, indeed, its radical negativity in comparison to the eventful present (15). “Theater’s promise therefore comes to reside in its dialectical construction of what isn’t here: theater becomes a site for utopia, and writing takes on the agonized function of both refusing and promising a constitutively unrealized alterity” (20). Thus, in demonstrating the failures and complications of the “heightened presence” of drama in performance, Jarcho formulates a “negative theatrics” that relies on writing as the key resource to both register and enact its utopian potentiality (20). Writing emerges as a productive, if protean, concept that Jarcho deploys in order to imagine what theater might look like “beyond drama.” The prepositional force behind this “beyond” is a multidirectional one that shifts throughout the book as Jarcho explores various facets of “writing.” In the book’s first half, “theater beyond drama” points towards a textual theater in the fictional and poetic works of James, Stein, and Beckett where the modernist difficulty of the text itself disrupts a sense of narrative cohesion and progression that imitates the discontinuity of theater; alternatively, Jarcho’s study of the Elevator Repair Service’s Gatz (a performance based around a six-hour reading of F. Scott Fitzgerald’s The Great Gatsby) questions the theatrical utility of adopting texts beyond dramatic literature for performance, and what it might mean to be “faithful” to them; lastly, in considering the plays of Beckett, Parks, and Wellman in the second half of the book, writing emerges as an alternative theatrical site beyond the dramatic stage, “as elsewhere than the world where performance happens,” thus instantiating a utopian alterity in the tension between the text and its performance (165). While the central argumentative thrust of some of the chapters occasionally sags under the collective weight of Jarcho’s otherwise astute readings, this seems like an unavoidable if minor issue given how much the rest of the work thrives on her close attention to mechanics and syntax (the tense shifts of James and Parks, the use of commas in Beckett) to track the confluence of theater and writing across the modernist and contemporary periods. Equally worth celebration is the work Jarcho does throughout the book to convince drama, theater, and performance scholars to attend more seriously and thoughtfully to the theoretical writing of Theodor Adorno. Adorno has been largely shunned by such critics due to his insistence of the “primacy of the text over its performance,” a stance that appears backwards—perhaps perverse—in lieu of how greatly performance has been privileged over the text in post-45 dramatic thinking and practice (14). Yet Jarcho insists that Adorno’s theories “correspond to a crucial problem with performance,” namely that of the “eventful present,” while also offering a way to think through that problem via his negative aesthetic theory that places utopian value in the “objectivation” of the textual object against the “happening” of performance (14–20). It is a distinctly reparative project that is “less concerned with whether Adorno is ‘right’ about performance than with the question of what his apprehensions might do to performance,” and throughout her study Jarcho turns to her deep engagement with Adorno’s work to unpack some of her knottiest problems (19). To those who might be skeptical of Adorno’s utility to drama, theater, and performance studies outside of a project already invested in dramatic writing (as I myself was for most of the book), Jarcho’s wonderful final chapter on Mac Wellman demonstrates Adorno’s surprising versatility: he’s invoked here to both problematize the central theatrical concerns of community and communication, as well as to construct a new theory of “expression that cannot be subsumed in the economy of the present, but [which] orients itself toward an eventual, utopian reception that cannot take place here and now” (199). It’s worth noting, to conclude, that Jarcho herself is an award-winning playwright and the artistic director of Minor Theater based in New York City. Jarcho only references this directly in the “Preface” and “Coda” of Writing and the Modern Stage, but I would argue that her role as theater-maker is crucial to the subtle moments of insight that distinguishes her academic writing throughout the book: she casually slips in considerations of what it might be like to stage a Stein play, how to account for the impossibility of Beckett’s “Silence” amongst the audience in performance, and what to make of the “beats” implicitly embedded in Park’s work (59, 96, 143). Furthermore, Jarcho’s questioning of what it means both to write a play and to write a play expands her critical horizon beyond texts of dramatic literature, or those that she describes as being “destined for performance” (21). Her inclusion of both fiction and poetry in her scholarly monograph about writing and performance gestures towards the uncomfortable fact that scholars of dramatic literature and theater have often found themselves on the margins of both Literary Studies and Performance Studies. However, it’s not as if turning to these texts alone will help to re-centralize studies of theater within these disciplines. Rather, taking seriously literary theories of theater in texts not “destined for performance” produces a broader formulation of what exactly theater is and does across the disciplines. In short, the achievement of Jarcho’s book is that it is not only a complex and challenging piece of scholarship that probes into the underappreciated potential of theatrical writing, but also serves as an invaluable model for scholars looking to renegotiate the place of theater both beyond and beside drama in the contemporary academy. In Postdramatic Theater (2006), Lehmann defines “drama” as a form of art focused on the linear unfolding of a fictional narrative or plot onstage; beginning in the 1970s, “postdramatic theater” emerges as a form more concerned with “the eventful present, the particular semiotics of bodies, the gestures and movements of the performers, the compositional and formal structure of language as a soundscape, the qualities of the visual beyond representation, the musical and rhythmic process with its own time, etc.” (22, 35). Furthermore, a text of some kind usually preexists a piece of “drama” and dictates its performance, while postdramatic “theater” relies on a “drifting apart of text and theatre” (46). Jarcho’s references to “drama” and “theater” throughout the text relies largely on this distinction, even as she herself works to deconstruct this differentiation. 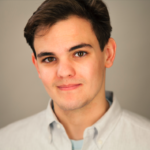 Chris Corbo is an English PhD Candidate at Rutgers University; he's currently at work on a dissertation that explores the impact of melodrama on the development and reception of modernist American drama.